The 2015 Razer Blade almost fully realizes 3K gaming, but unscalable applications and games prevents this dream from becoming a reality. Where can you go after making one of the most wonderfully crafted and gorgeous gaming laptops? Not very far, if the fourth generation Razer Blade gaming laptop is any indication. Unlike with the 2014 Blade, Razer hasn't changed up much other than swapping out the internals with more memory, a faster processor and the Nvidia's lauded mobile graphics chip, the GTX 970M. Otherwise, the laptop features the same exact chassis and high-resolution QHD+, 14-inch screen. Of course, this isn't a bad thing, as these were both qualities I loved about yesteryear's model. It's also still an amazing feat that Razer has managed to fit all this power into a 0.7-inch (17.9 mm) thick slab of aluminum. Razer might have been ahead of the game last year, but other laptop makers are quickly catching up. In the last few months, both the Digital Storm Triton and Origin EVO15-S have wowed me as well-equipped, thin and light machines that nip at the Razer Blade's coattails. This is still undoubtedly an exceptional machine, but it's just not that well ahead of the pack anymore. Unless you were to pull the panels off of the new Razer Blade, it is completely indistinguishable from last year's model. Again, that's not necessarily a bad thing. The Blade is still unrivaled as one of the best looking gaming laptops around, thanks to its sharp aluminum chassis that's been anodized in jet black. 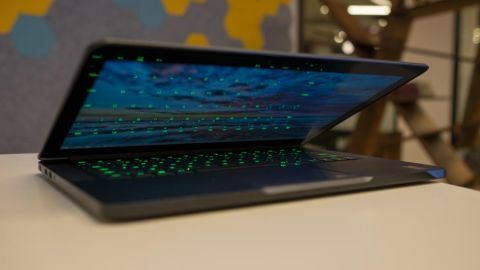 However, as attractive as Razer's laptop design is, it's easy to look at the Blade and wonder whether Apple released a 14-inch Retina MacBook Pro in black - the two machines are that similar. There are plenty of elements that are clearly MacBook-inspired, from the rounded edges to the wide, sturdy hinge. Still, Razer has introduced a few original touches, including the spun metal power button as well as the two small ridges on the back of the screen lid. It's also impossible to miss that neon, triskelion snake logo on the notebook lid. Razer has also improved upon the trackpad buttons. With the 2014 Blade, we found the mouse buttons to be rather flimsy, a problem that's been corrected with click switches that are firmer. Meanwhile, the trackpad has remained silky smooth to trace your finger over. Surprisingly, the keyboard left more to be desired with extremely short travel on its keys. You can type at a brisk pace, but the act of typing on the Razer Blade feels unsatisfyingly mushy.